"Chinese cinnamon" redirects here. For the tea also known as "Chinese cinnamon", see Rougui tea. The tree grows to 10–15 m (33–49 ft) tall, with greyish bark and hard, elongated leaves that are 10–15 cm (3.9–5.9 in) long and have a decidedly reddish colour when young. Chinese cassia is a close relative to Ceylon cinnamon (C. verum), Saigon cinnamon (C. loureiroi), also known as "Vietnamese cinnamon", Indonesian cinnamon (C. burmannii), also called "korintje", and Malabar cinnamon (C. citriodorum) from Malabar region in India. In all five species, the dried bark is used as a spice. Chinese cassia's flavour is less delicate than that of Ceylon cinnamon. Its bark is thicker, more difficult to crush, and has a rougher texture than that of Ceylon cinnamon. Most of the spice sold as cinnamon in the United States, United Kingdom, and India is Chinese cinnamon. "Indonesian cinnamon" (C. burmannii) is sold in much smaller amounts. Chinese cassia is produced in both China and Vietnam. Until the 1960s, Vietnam was the world's most important producer of Saigon Cinnamon, which has a higher oil content, and consequently has a stronger flavor. Because of the disruption caused by the Vietnam War, however, production of Indonesian cassia in the highlands of the Indonesia island of Sumatra was increased to meet demand. Indonesian cassia has the lowest oil content of the three types of cassia, so commands the lowest price. Chinese cassia has a sweeter flavor than Indonesian cassia, similar to Saigon cinnamon, but with lower oil content. 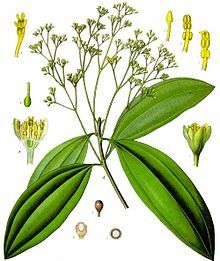 Cassia bark (both powdered and in whole, or "stick" form) is used as a flavoring agent for confectionery, desserts, pastries, and meat; it is specified in many curry recipes, where Ceylon cinnamon is less suitable. Cassia is sometimes added to Ceylon cinnamon, but is a much thicker, coarser product. Cassia is sold as pieces of bark (as pictured below) or as neat quills or sticks. Cassia sticks can be distinguished from Ceylon cinnamon sticks in this manner: Ceylon cinnamon sticks have many thin layers and can easily be made into powder using a coffee or spice grinder, whereas cassia sticks are extremely hard and are usually made up of one thick layer. Chinese cassia (called ròuguì; 肉桂 in Chinese) is produced primarily in the southern provinces of Guangxi, Guangdong, and Yunnan. It is considered one of the 50 fundamental herbs in traditional Chinese medicine. Due to a blood-thinning component called coumarin, which could damage the liver if consumed in larger amounts, European health agencies have warned against consuming high amounts of cassia. Other bioactive compounds found in the bark, powder and essential oils of C. cassia are cinnamaldehyde and styrene. In high doses these substances can also be toxic for humans. ^ Xi-wen Li, Jie Li & Henk van der Werff. "Cinnamomum cassia". Flora of China. Missouri Botanical Garden, St. Louis, MO & Harvard University Herbaria, Cambridge, MA. Retrieved 28 March 2013. ^ a b "Cassia: A real spice or a fake cinnamon". China Business Limited as Regency. 2014-02-26. ^ Wong, Ming (1976). La Médecine chinoise par les plantes. Le Corps a Vivre series. Éditions Tchou. ^ Hajimonfarednejad, M; Ostovar, M; Raee, M. J; Hashempur, M. H; Mayer, J. G; Heydari, M (2018). "Cinnamon: A systematic review of adverse events". Clinical Nutrition (Edinburgh, Scotland). 0. doi:10.1016/j.clnu.2018.03.013. PMID 29661513. Chang, Chen-Tien; Chang, Wen-Lun; Hsu, Jaw-Cherng (August 2013). "Chemical composition and tyrosinase inhibitory activity of Cinnamomum cassia essential oil". Botanical Studies. 54 (1): 10. doi:10.1186/1999-3110-54-10. PMC 5432840. PMID 28510850.